Frankie Goes To Hollywood had some good advice when they told us to "Relax" in 1984. Panasonic's Urban Collection Massage Chair helps us do that even better. A more high-end, higher-point reward option, the Urban Collection Massage Chair offers four pre-set programs with eight additional manual modes that result in a combination of 44 different types of massage experiences. One mode in particular, the "Chiro Mode," which is specially designed to provide better muscle relaxation and eliminate tired, over-worked muscles. 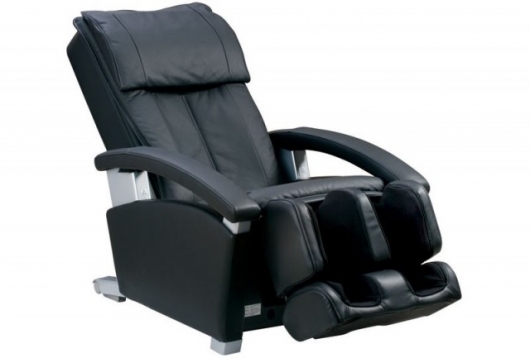 The EP1285 model features a 14 airbag cirulation system that provides a more complete lower body massage. An adjustable ottoman is included in the chair that also fails to neglect the importance of a good old-fashioned calf and shin massage. While massaging the legs, the ottoman raises and lowers your legs in 20 degree increments to alleviate the stiffness in your lower back, hips and thighs. Stress is a common thing in a work environment. Taking care of yourself, even with a quick 15 sitting time in a Panasonic Urban Collection Massage Chair, can do wonders for your health. Releasing tension in over-worked muscles while also helping alleviate stress can help yourself (or any worker for that matter) be more productive and efficient for the next working day. We've talked about TVs and tablet PCs at CES 2011. A common bond (internet aside) that they shared at CES was a revived push for 3D. More particularly, glasses-free 3D technology. One of the barriers to entry for 3D technology to begin with were the glasses. A compnent to most any 3D device on the market now, glasses are bulky, awkward and fairly expensive. In order for 3D to really see a significant increase in the rate of adoption, a glasses-free approach needed to be taken. The market has spoken and manufacturers are definitely heeding the call. How does glasses-free 3D actually work though? The key to creating a 3D image is to show a slightly different perspective to each eye so that the brain processes those images as having depth (hence why those 3D glasses in your comic books had different colored lenses). Active shutter glasses, what's found with most devices now, blocks out one side then the other at a remarkably rapid rate as to achieve the same effect. With glasses-free, your television actually displays multiple images at the same time except in alternating bands. Using a convex lens is placed over the screen so that the image will appear differently at different angles. It's similar technology as what is used for holographic images. Pretty cool stuff. What's this mean for 2011? Most likely, 3D will be found on devices with smaller screens. Nintendo DS made the announcement of utilizing this technology eons ago, while Sony's 3D cameras will have this capability too. Smaller screens are easier to format for glasses-free and make it harder to detect the imperfections that are easily noticeable for a larger area like a TV. One device of note included Toshiba's 3D laptop, which (according to many sources) was one of the stand out products in the glasses-free category. What do you think? Will see more 3D products as 2011 progresses? The new Panasonic HM-TA1 provides a ton of features and easily fits into your pocket. The camera can shoot in full HD quality and provides a USB terminal that makes it easy for PC connection to quickly share your videos via social media sites like YouTube and Facebook. Not only does the USB connectivity make social sharing easier but it also works as a dual purpose via Skype. While connected to your PC, the TA1 can double as a webcam, making video conferencing that much easier.